Serving everyone from beginners to professional marketers, Campaigner brings nearly two decades of marketing experience and growth to your email campaign. With live webinars, Campaigner could teach you how to create winning email marketing campaigns and also offers 24/7 toll-free technical support by phone or email, should any questions arise. Helpful articles and YouTube training videos can make your life a lot easier, helping you learn and grow with your company. With a 30-day free trial and no binding contracts, you have nothing to lose by giving this renowned service a try. 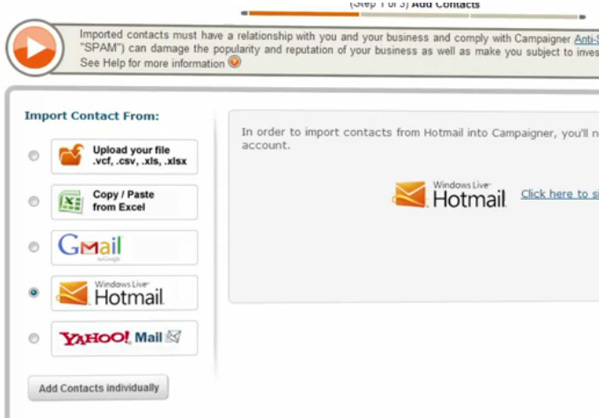 Campaigner can import contacts in one of three ways: You can manually enter your recipients one by one; migrate them from online services like Gmail, Yahoo or Hotmail; or upload them through a CSV list, which can be easily created in Excel. Campaigner also incorporates custom data fields for subscribers, meaning you can select lists of readers to target specific interests. As well as showing you who opts out or labels your email as spam, Campaigner also separates hard bounces (those that will never arrive) from soft bounces (those that could get delivered if tried again). You can schedule emails daily, weekly, monthly or annually depending on what dates you select. Whenever you send an email, you’ll have a ten-minute window to recall it if you have second thoughts or need to make edits. Any campaign can be readily copied for use with a different list, meaning you can use your most successful templates over and over again. With easy-to-use plug-ins, you can drop a link to your LinkedIn, Facebook or YouTube page with the push of a button. Campaigner also offers a mailing list sign up form for your Facebook page to help your social media presence fuel your email campaign and vice versa. Campaigner integrates with Google Analytics for thorough email campaign reporting, including the average number of page views tied to an email and sales per campaign. You’ll be able to track conversions on an hourly basis to determine the most effective time to send emails. Campaigner sends all HTML emails as MIME, which means that most recipients will get your full HTML message, while recipients with stricter firewalls will receive a plain text version. You can get multiple reports about your emails including open and click-through rates. Campaigner’s advanced reporting tallies your campaign views on Facebook, Twitter, LinkedIn and Google+. Campaigner makes drip marketing easy with an unlimited number of emails that can be sent with each subscription. Campaigner also features autoresponders that can be triggered by specific actions, like someone signing up or clicking on a specific link in your campaign. 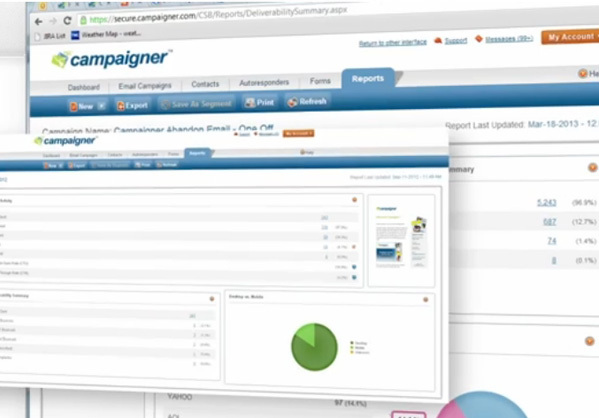 Campaigner’s customer relationship manager feature integrates with Salesforce to directly query your recipient database. This helps you better segment your emails based on demographics or click-through data from previous emails. 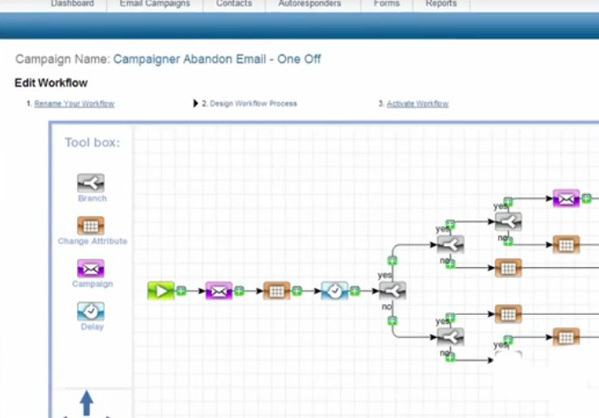 Campaigner also features integration with Akamai and Yahoo Shopping. Thanks to parent company, j2 Global, Campaigner is poised to develop customized online applications for your business. The company’s software engineers will be there for you every step of the way, from design to testing to implementation. On many of its 600+ templates, Campaigner features responsive web design to increase visibility on all devices. Campaigner also provides a healthy variety of template options, ranging from specific industries to holiday celebrations. 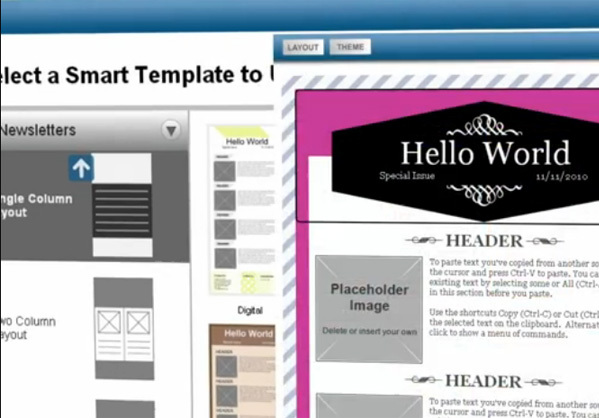 Campaigner offers a basic and advanced email editor to meet your area of expertise in design and marketing. The basic editor is better used by people who don’t want to work with HTML, while the advanced editor offers more design flexibility for those with a working knowledge of coding. Campaigner has some of the best prices in email marketing, offering unlimited monthly emails to 1000 subscribers for just $10 a month. Campaigner bills are based on the total number of subscribers you have had on your list during the month, not the number at any one time, regardless of unsubscriptions and bounces. Campaigner can comfortably handle the delivery of 10,000,000 emails at any given time, but you’d need to call the company’s sales department to arrange a custom solution for a larger send. Campaigner is a no-nonsense solution to email marketing that is one part of a growing U.S.-based digital media company. Having unlimited tech support is much appreciated in the occasionally complicated field of email marketing, especially since the support engineers obviously know their products and take pride in finding solutions to problems. On top of a 30-day free trial, clients may cancel at any time with no contracts or hidden fees. Based on how much the company clearly cares about your experience, Campaigner is well worth trying if you want to get serious about email marketing.